· “Deliver improvements to the Supporters' both on match-day and through Supporter initiatives”. 2. To gather qualitative feedback from a representative sample of the membership in respect of the operation of the Dragons Official Supporters Club, which combined with quantitative feedback from a parallel survey will provide the Committee with the necessary information to improve the offer of the club to its members. There will be 2 focus groups held, on the 18th April 2018, and the 26th April 2018. Both will be held at Rodney Parade (exact location TBC) and will start at 7:30pm, and be of 90 minutes duration. The Focus Groups will be facilitated and noted by a member of the DOSC committee, and application to take part in a focus group will be open only to individuals who are signed up members. In the event that the sessions are oversubscribed, applications will be anonymised by name, and then selected randomly from a hat. o How do you think the first year of the rebranded Dragons has gone? o What are your views in respect of the Dragons “long term strategy” going forward? o What are your views on the Dragon’s taking games to other venues in the region? o What are your views on the current ticketing arrangements for Judgement Day? o What are your views on the match day provision of the Dragons? o What are your views on how the DOSC is run currently? o What are your views on the approach of the DOSC Committee? o What more could the DOSC offer that it does not currently do so? o What do you think that the DOSC should utilise any surplus funds for? The late announcement of the fixtures meant that a last minute scramble for plane tickets ensued just before Christmas. Whilst a large contingent ended up on the Friday night Bristol to Bordeaux flight (which just so happened to also be the players flights), there were intrepid travelers flying from from Stansted, Luton, via Amsterdam, and some into Bergerac. With organisation only slightly less than that of a military operation, the annual shambolic decampment began. Perhaps the first indication of what was to come was when one poor Dragon had his Airport Executive Lounge membership revoked in Bristol after taking "an unreasonable amount of scones" from said lounge to feed the hungry masses still in the bar. Miraculously, everyone managed to get on the flight, though with Gavin Henson sat three rows in front, the temptation to start throwing ice cubes was hard to resist. Safe in Bordeaux (with the exception of this poor writer, who got stuck on the airport shuttle bus and wandered aimlessly around the city for 2 hours) refreshments were found, and a taste for Pastis regained. Matchday dawned cold but clear, with a glorious view from the hotel over Bordeaux Cemetery (#102 thing to do in Bordeaux according to TripAdvisor). An early(ish) morning (ok, afternoon) walking tour of the city was undertaken, though the handy guide that one of the tourists had made did have the wrong pictures against the landmarks. Attached is the one cultured picture taken all weekend. 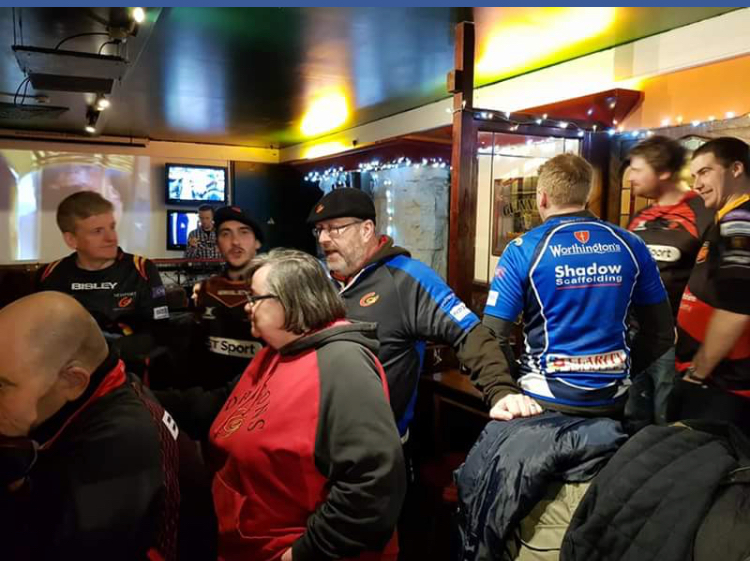 At 3pm, we set up base camp in the Connemara Pub, where we later met up with the "UBB Angels" (The UBB supporters club). I'm pretty sure there were songs and presentations, but I think the attached photo's tell a better story of the next few hours than my memory allows. Also in place was a "moat" around the pitch, preventing any pitch invasions, scuppering our initial plans. The game - what to say. Most had travelled with a fair bit of trepidation, but the Dragons gave a great account of themselves through the first half, and if truth be told, should have been further ahead. Whilst UBB took control in the second half, the frustrating thing was that this was a game that we could, and maybe even should have won. As we found out the next weekend, a bonus point would have been enough to see us through. Alas, it was not to be. Landman and Pretorius were the standout players for me, with an honourable mention to James Benjamin for taking the longest possible route to the tryline for his score. The DOSC are delighted to launch their own 'obble' hats, with our Partners from Oddballs, raising funds and awareness for Testicular Cancer. The hats are priced at £15, and are available through the link below. Please select below for details on how to book tickets for a Supporters event with Elliot Dee, Shaun Holley and much more... in addition this event will also help raise funds for the Hampson Foundation, in support of our own Ed Jackson. On Wednesday 25th of Oct 2017 at 19:00 we are proud to announce our first formal Dragons' Supporters event of the season. Our Sponsors Worthington's have offered significant support in order to help us hold a 'Worthy's Wednesday' Supporter event, for Dragons Supporters to spend an evening together, mixing with members of the playing and coaching staff, and getting an opportunity to win some Dragons' memorbilia. The event will be held upstairs in the Bisley Suite at Rodney Parade, and will commence at 19:00. Entrance will be gained through tickets, in the form of charity donations, which are to be purchased prior to the event wherever possible. We will be able to distribute tickets also on the night. It is suggested that these tickets are 'sold' for a small charity donation, which will be used towards our chosen charity, the Hampson Foundation. The Foundation are currently helping with the required support necessary for Dragons' No 8 Ed Jackson to complete his recovery from a serious neck injury. As such, if you would be so kind, we would therefore ask for a £5 per person donation, in order to help drive the success of the evening. The evening will be hosted by Sean Holley, and offer a buffet for attendees through the evening. It will also deliver a number of activities including a raffle for some high quality Dragons' prizes, and a Q&A with Dragons Players and Staff. It will also be an opportunity for us to present Elliot with his Supporters' player of the month trophy for Sept, and award which I'm sure we all agree is richly deserved based on his form so far this season. As stated the Hampson Foundation have been supporting our own Ed Jackson through his very recent rehabilitation from serious injury, and we therefore feel would be a very worthy cause for us Dragons Supporters to get behind, in their goal to supporting young people recover from serious sports' injuries. Hopefully you can sacrifice a few hours, and a small amount of funds, on the 25th in support of our Dragons family. We hope to offer a number of these style events throughout the season, both to the continue the development of the Supporters' relationships with our team/coaches, and also raise money for a very worthwhile charity. Any questions please get in touch with us through normal channels. In the meantime we'd really appreciate if you could help spread the word regarding this evening, to not only have an opportunity for us to rightly recognise Elliot's efforts, but also help support Ed Jackson, and those in similar circumstances, through our chosen charity.